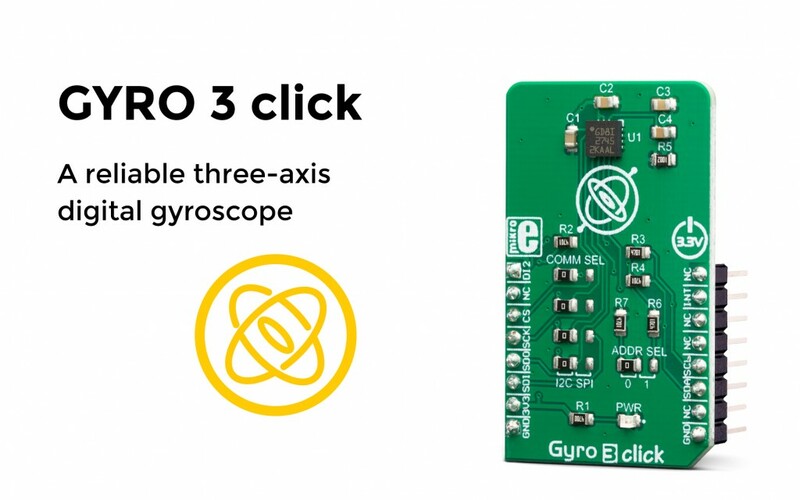 Gyro 3 click is a digital gyroscope which is able to sense motion over three perpendicular axes. It is equipped with the I3G4250, an integrated three-axis digital gyroscope from STMicroelectronics, produced using a proprietary CMOS micromachining technology, which results in very good linearity over temperature and excellent output stability when no motion applied. The I3G4250 sensor features onboard signal processing (low-pass and high-pass filtering) as well as user selectable angular rate speed ranges of ±245, ±500, and ±2000 dps. This allows fine-tuning according to specific requirements of the application. A FIFO buffer with two dedicated interrupt lines helps with the firmware optimization and power consumption. "A gyroscope (from Ancient Greek γῦρος gûros, circle and σκοπέω skopéō, to look) is a device used for measuring or maintaining orientation and angular velocity. It is a spinning wheel or disc in which the axis of rotation is free to assume any orientation by itself. When rotating, the orientation of this axis is unaffected by tilting or rotation of the mounting, according to the conservation of angular momentum. " For more information about the Gyro 3 click™, please visit our website.